On September 18th 2018, we launched our new report, “No Water, No Growth – Does Asia have enough water to develop?”; a comprehensive look at not just China’s but Asia’s water challenges, particularly for 10 major Asian rivers. We held many events during the week and had the pleasure of hosting four water experts/ laureates: Professor Asit Biswas, Professor Shaofeng Jia, Dr. David Molden, and Dr. Cecilia Tortajada. 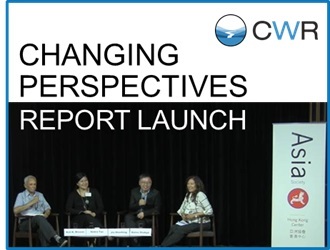 We and the experts met investors, philanthropists, C-suite executives, journalists and NGOs at a variety of public and private forums where we discussed the report and the need to shift the conversation from access to clean water to water-nomics. At our inaugural Ideas Lab event, we discussed the need to plug data gaps; shift the water conversation from solely focusing on clean water to also include water-nomics; focus on hotspots at the river basin level; and how business needs to go business unusual to ensure a future with water. We will publish a paper summarising the discussions, so stay tuned! Below are some takeaways from the honest discussions at the public launch on the 20th of September at Asia Society. We have a romanticised view of mountains & glaciers – big &white glaciers or green trees. However, as images in the report and those presented at the Asia Society by explorer Jeff Fuchs show that is not the case for many glaciers in the Hindu-Kush Himalayas. The picture below (one of the images shown) shocked many people in the audience because the glacier pictured isn’t this romanticised view, it’s grey, brown and looks like rubble. Having lived here for centuries, these people know a lot about the region and we can learn from them about the changes happening. Moreover, with so much data around glaciers & mountains missing, we urgently need more. Therefore, we need to invest because it will not only benefit the few people that live there but also businesses and investors who will have access to more real-time information about potential issues that could hurt their bottom line. Rivers are transboundary; 8 of Asia’s 10 major rivers are transboundary. Clearly this necessitates inter-government communication and agreement. Some agreements already exist but better communication is necessary to ensure that resources are shared fairly. Many usually say here that much of the blame lays with China. For example, China is not a member of the Mekong River Commission (MRC), yet as Debra pointed out, the MRC’s own river monitoring arm highlights that Chinese dams are helpful during floods and droughts as they are used to reduce river flow during wet season and increase the flow in dry season. Professor Jia also mentioned that between May and November each year, China and India share data for the Brahmaputra River as this is the main flooding season. Where they can’t share the data, they send a signal to let those downstream know about any potential floods. Clustered assets along vulnerable rivers. China is already implementing a number of policies to ensure better water and environmental managements. In comparison to India, it is ahead of the curve. Unfortunately, as Professor Biswas mentioned, India has a very different water management and political system and therefore not all lessons can be transferred. Hong Kong does not have a good reputation for its water management – water prices have not increased since 1996 and we use too much – ~220 litres of water / person / day, but technically we should need only ~75 litres. Even though Professor Biswas was not complimentary about Hong Kong’s water management, he said there were many other candidates that would be at the top of his list for the next Cape Town. He predicts that 6 major cities in India will suffer from acute water scarcity and pollution in the next 10 years. When pushed for names, he mentioned Delhi, Bangalore, Hyderabad, Chennai, Calcutta and Mumbai. For example Delhi, which currently struggles to provide water and waste water treatment for its population of 25 million, will have 43.5 million people by 2035! On a more positive note, we have some great examples of water management in Asia, even though the Western world is typically held up as the best at water management. Singapore has done a good job so far. Another example is Phnom Penh, where the water supply authority is run without subsidies but charges by water use, as it is assumed that the rich use more water than the poor. Therefore, the rich subsidise the poorer clientele but everyone has access to clean water. Overall, the honest discussion by the members of the panel and their answers to the audiences answers highlighted that we need to re-think our water conversation – it is not just about access to clean water. Many countries in Asia do not have enough and as economies run on water, they must re-assess their development plans to ensure they can grow economically and simultaneously provide better standards of living for their citizens. Dharisha is responsible for CWR’s work related to enabling the financial industry to fully integrate water risk into the investment process thereby waterproofing portfolios. She hails from the finance industry and has joined CWR as she believes that despite being significant investment risks, climate and water factors are downplayed in the decision-making process. Not only are there various types of water risk (scarcity, pollution, floods, regulatory) resulting in multiple valuation methods, water is also a locational risk, which lends complexity to its valuation. Dharisha hopes to help build consensus, bridge the gap between finance and science, and engage with investors to incorporate these risks. This could also lead to innovative Green Finance instruments becoming more prevalent. Prior to joining CWR, Dharisha worked for a long-only public equities fund with a focus on sustainability. In addition to fundamental bottom-up analysis of companies, she led sustainability research and managed long term engagement strategies with a handful of firms. She has also worked in the impact investment space in London and Singapore where she provided technical assistance to social enterprises, helped them raise equity investments, and managed a debt portfolio. Dharisha has a Bachelor’s degree in Economics and a Masters in Development Studies.